On Tuesday we shared our lineup of Folger sessions at this year’s convention of the National Council of Teachers of English (NCTE). Today we’re blogging from the Minneapolis Convention Center, where we’re getting ready for tomorrow’s interactive sessions (join us!) and lots, lots more. 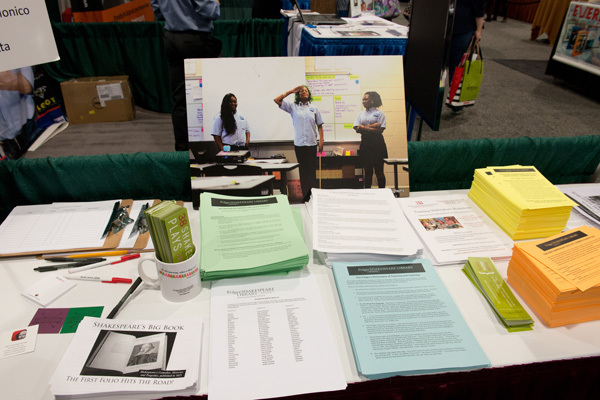 Have we mentioned how much we love NCTE and this annual conference? What a lively, inspiring, enlightening scene! We’re honored to be among so many of the best people on earth: teachers. One of the loveliest things about this conference is how its reunites us with old friends and connects us with new ones. We’re enormously grateful for the chance to have so many great conversations with so many committed, smart teachers. If you’re at NCTE 2015, we hope you’ll stop by our booth to chat with us and check out some teaching demos and free classroom materials. Beyond our 5 Friday sessions, we’ve got a lot going on. And you’re officially invited! If you can’t make it in person, read on to learn how you can connect with us on the web! Teaching Idea for Monday: Grab our engaging plan (and handout) for your first class back! Folger Digital Texts: Teachers demonstrate how to use the free, online Folger editions in class. WILLLessons: Participate in quick demos of effective classroom techniques, all on Saturday. Folger Editions: Our friends at Simon & Schuster are giving away Folger Editions of King Lear and The Tempest. Teaching Shakespeare Institute 2016: Learn how to apply for our flagship program—4 intense weeks of scholarship, performance, and classroom practice—happening this summer in DC. Master Classes: Sign up for our live-streaming classes on Hamlet, Othello, and Julius Caesar. Professional Learning Days: Request a lively and rigorous one- or two-day teacher workshop! First Folio (Facsimile) Giveaway: Learn about Shakespeare’s big book that rocked the world in 1623 and ever after. See how you can get involved as the First Folio visits every state in 2016. And… get in on our giveaway of a beautifully bound facsimile of the First Folio! #MySHX400: What’s your Shakespeare story? Learn how you and your students can participate in this big and bold online project. Make sure that you and your colleagues are on our email list so that we can send you teaching materials, announcements (big ones are coming in 2016!) and special teacher invites. Take Shakespeare to the streets. Join our Third Annual Shakespeare Flash Mob on Saturday at 5:00PM in Lobby A of the Minneapolis Convention Center—just outside the Exhibit Hall. The first 100 participants get a Folger edition of Macbeth! Follow us on Twitter (@FolgerEd, #FolgerNCTE) and Facebook (Folger Education).